According to a new pamphlet by the Victorian Government it’s safe to inject 100,000 vaccines into a child…AT ONE TIME! 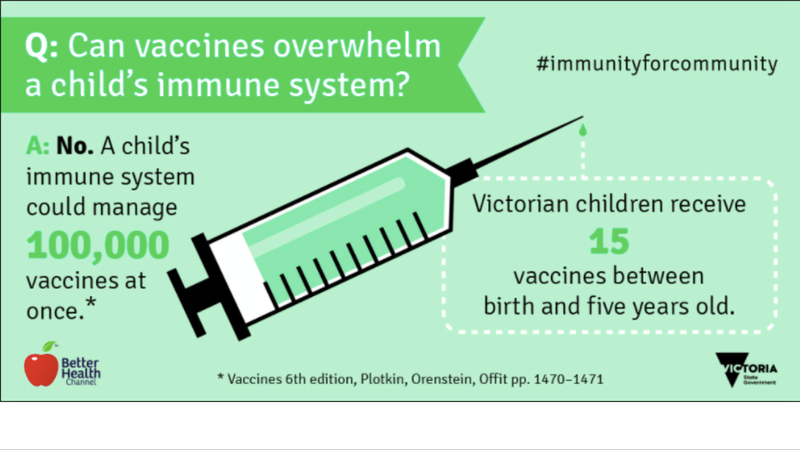 (RealNewsAustralia.com) A pamphlet published by the State Government of Victoria in Australia (pictured below) poses the question to the public, “Can vaccines overwhelm a child’s immune system?” To which they answer, “No, a child’s immune system could manage 100,000 vaccines once. *” The symbol at the end denoting a footnote to guide readers, in fine print, to the source of the claim. This what a vaccine antigen is described as at the ScienceDirect Website. However Dr Offit’s quote is misrepresented by Victorian Health Minister Jill Hennessy and her team. Dr Offit said 10,000 vaccines at one time whereas the pamphlet pictured says that Dr Offit said 100,000 vaccines at one time. Wrong by a factor of x10. The other important part is Dr Offit adds the term antigens. So as not to say the whole vaccine dose itself which includes ingredients such as thimerosal, aluminium, formaldehyde, mercury, polysorbate 80, MSG to name a few. Jill’s pamphlet doesn’t make this distinction. It claims the whole vaccine itself. All 100,000 doses of them. Incidentally a dose of say the MMRV vaccine is approximately 0.5ml. So multiply that by 100,000 gives you 50,000ml. 50,000ml is 50 litres! Yes that’s right, 50 LITRES!!! So what this pamphlet is saying is that a child can be injected with 50 litres of vaccines and their immune system can manage it. Let’s not forget that even an adult couldn’t be injected with 50 litres of saline solution let alone vaccines. IT WOULD KILL THEM! Considering the HepB vaccine is administered at birth and the average new born weighs between 3-4kgs, injecting them with the equivalent of 50kgs of liquid is not only unthinkably deadly but akin to something you would see in a horror film. There are no risks in vaccinating your children. has declared war on the health of Australians, especially Australian children, and shown a complete disregard for your safety. Whether you or they believe that the vaccines are 100% safe and effective has been thrown out the window. They seem to think that the Australian public are fools. They seem to think that people will see this blatant dangerous propaganda and believe it verbatim. They’re wrong. People are waking up and sharing this information like wildfire and the powers that be are losing the fight. Why else would they make obvious mistakes like this? even 100,000 pure saline injections would kill a child. These people are absurd to a hysterical level. My child’s MMR caused his autism. That’s a fact. 100,000 x 0.5ml = 50 litres!!! Oh crap. I must have typed it in the calculator wrong! Whoops. Will change it now! Now I know what I did. When search for dose amounts I found some saying .1ml and .5ml. I did the math on the .1ml but wrote the .5ml in the article. This woman should be forced to resign. Not only is she telling dangerous lies that can affect a child’s health but she is wasting taxpayers money on getting this crap printed. Everything she has said about vaccines to date can be proved as wrong. Why does she still have a job! Not doing the vaccine industry any favours, methinks. Certainly providing even the most ardent vaccine enthusiasts something to think about. – Russell, Bertrand. The Impact of Science on Society. 1951.
ps.the victorian gov’s logo is right on target with the NWO program – inverted pyramid !